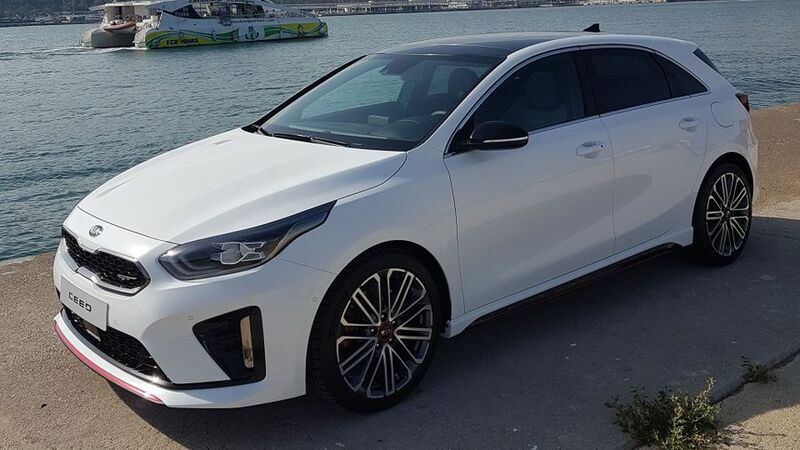 Kia has revealed its new Kia Ceed GT, which will rival the likes of the Volkswagen Golf GTI and Hyundai i30 N.
Compared with the standard Ceed, the GT model – as you might expect – looks more sporty. It’s got a new front bumper design with larger air intakes and gloss black trim along the base, along with subtle red highlights in the honeycomb grille. You still get the Kia tiger-nose grille and ‘ice-cube’ LED daytime running lights of the standard Ceed, of course. The Ceed GT also has glossy chrome window surrounds, gloss black/red side sills and red brake calipers. At the back you get GT bumpers, a subtle gloss black rear diffuser, GT badging and a small roof spoiler. You’ll be able to get your Ceed GT in eight paint finishes, and the GT model also gets its own 18-inch alloy wheel design. The Ceed GT sits 5mm lower than the normal Ceed and Sportswagon models, and the suspension is stiffer, too. It is more of a ‘warm hatch’ than a full-blown ‘hot hatch’, but if you want a bit more performance than a regular hatchback, and still want to be comfy on the motorway, it could be a good option for you. The interior of the Ceed GT is very much like the Ceed hatchback, which we have plenty of experience with. That is definitely no bad thing. It’s comfortable, the plastics are of good quality in all the important areas, and it all works well. Sporty touches include some metallic trim, a black roofliner (instead of the grey on the normal Ceed), D-shaped steering wheel and aluminium driver pedals. Cars with an automatic gearbox get metallic shift paddles behind the steering wheel. You get sports seats in the front, which have firmer side and thigh bolsters compared to the original Ceed GT. The seats are trimmed in black leather and suede, and finished with a red GT logo and red stitching. Like in the normal Ceed hatchback, you can get a 7.0- or 8.0-inch touch-screen. Both have Apple CarPlay and Android Auto connectivity, along with Bluetooth and DAB, and the bigger screen gets you sat-nav on top. On the options list, you might want to consider the more powerful JBL sound system, heated windscreen – which is super helpful in winter – wireless smartphone charger, heated and ventilated front seats, and heated rear seats, so there’s no jealousy from the back. The GT model is no less practical than the standard Ceed, with the same 395-litre boot and low boot lip. You can raise or lower the height of the boot floor to fit larger cargo, or create a hidden compartment. What engine options are there? The Ceed GT comes with an updated 1.6-litre, turbocharged petrol engine, with 204 horsepower. It comes with a six-speed manual gearbox as standard, but is also available with a seven-speed automatic gearbox, which you can control with metal steering wheel paddles. If you do opt for the automatic gearbox, you’ll also get a Drive Mode Select system, which comes with a Sport mode. Switching it to Sport changes the steering weight and the throttle and gearbox responses to maximise acceleration. Normal mode maximises fuel efficiency. And if you like your exhaust note to be sporty, Kia has paired the engine with an electronic sound generator so an appropriately naughty noise is piped into the cabin. What safety kit do you get? There’s a really good amount of standard safety systems on the Ceed GT, including High Beam Assist, Driver Attention Warning, and Lane Keeping Assist with Forward Collision-Avoidance Assist. On the options list, you can get Lane Following Assist which helps keep the car in its lane on the motorway. The system also controls acceleration, braking and steering. On top of that, there’s a Smart Cruise Control with Stop & Go system, Blind Spot Collision Warning, Rear Cross-Traffic Collision Warning, Smart Parking Assist, and a pedestrian recognition with haptic steering wheel warning which you can get as an add-on to the Forward Collision-Avoidance Assist system. And as ever, you get Kia’s very impressive seven-year, 100,000-miles warranty. The new Ceed GT will only be available to European drivers, and will go on sale from the first quarter of 2019.